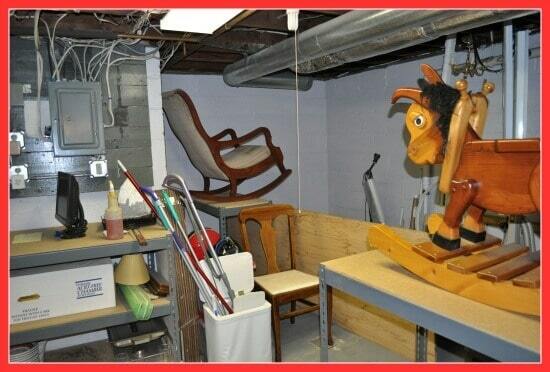 Basement Declutter Project: With Before & After Pics & Tips! After 12 years of using our basement as a giant dumping ground as part of our attempt to keep the upstairs living areas of our home neat and organized, it was time to finally get organized, and do something about this “giant closet” that I stuffed everything into! Here's the story of our basement declutter project- one that we did in just 28 days- tackling it bit by bit! Inspired by Org Junkie‘s 29 Day Challenge, Steve and I decided that it was finally time do so something about our cluttered basement. We began by spending a few hours together one Saturday afternoon to sort through the furniture that we wanted to keep, and some that we wanted to donate, and found an unused corner of the basement in which store all of it. And that was the “motivational kickoff” event that got us started. I mean seriously, check out this before and after picture of the exact same area! Shocking, isn't it? 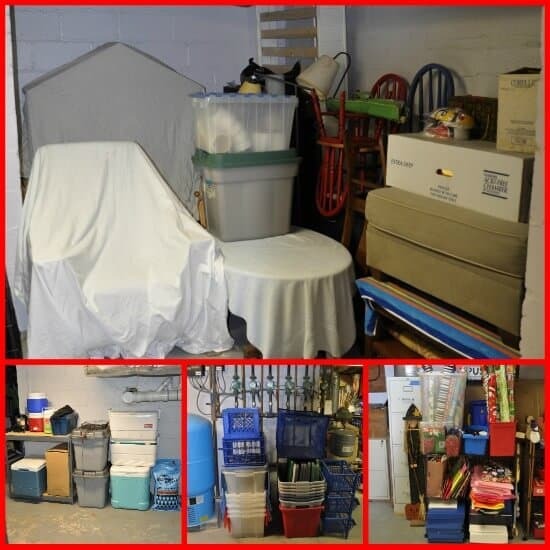 Why spend time on a basement declutter project before you declutter the rest of your home? I mean, after all, it's not like it is a room that anyone is ever going to see anyway (that is until I displayed our room of shame here on the blog!). The problem was that we had developed a habit of cleaning and organizing the rest of the house by stuffing all of the unneeded items from the other rooms into the basement. If I needed a new vacuum cleaner because the old one stopped working, I would store the new one upstairs in the cleaning closet and put the old one in the basement “just in case”. If the pantry was getting too “filled up” with appliances that I rarely used, I solved the problem by storing them in the basement. Kids toys that they never played with? Basement. School projects that we wanted to keep around? Basement. New shoes? Keep the box they came in down in the basement. Cute shopping bag? Keep it around in the basement. And if I started my home decluttering project in one of the upstairs rooms, I knew that I was going to rely on this old habit once again. BUT if I started in the basement, did some SERIOUS streamlining followed by organizing the space into small areas by categories- then I knew that as we moved on to tackle the rest of the house, we would no longer use the basement to store things that we really shouldn't be keeping around. 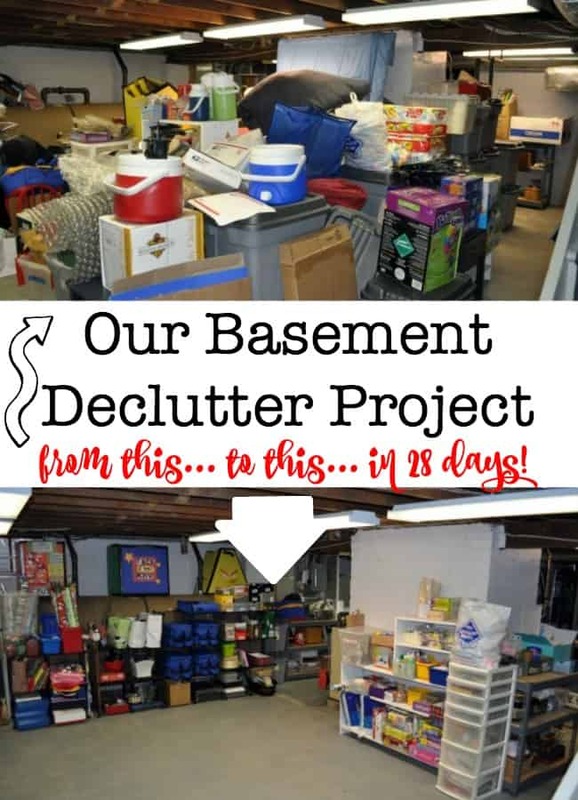 How did we accomplish our basement declutter project in just 28 days? My husband and I started by spending a few hours in the basement together on Saturday afternoon- sorting through the big furniture items and discussing how we could better store things. We also made an agreement right up front, that if I decided the item should go, either through donation or trash, that Steve wouldn't question the decision. He gave me “carte blanche” to conquer the clutter! After that first weekend, I tried to devote an hour or two just a few afternoons a week to tackle one small area of the basement at a time. In order to stay focused I would start in one “section” and work my way from the left to the right, touching every single item, every box, and every bin. Nothing was left until “later”. Every item was dealt with as I came to it. By dealing with it- I mean that I needed to decide should I keep it, donate it, toss it or relocate it? And the criteria to keep an item was that I had to love it, use it, need it, or want it, AND I had to have room to store it! I found that working in 1-2 hour bursts and then walking away from the project when I started to become sluggish with my decision making was the best course of action. If I started to linger in my emotional attachment to an object, then I knew it was time to take a break and return to the basement declutter project with a fresh perspective tomorrow. The hardest part of our basement declutter? Staying “In Scope”! At first I thought the hardest part of the challenge was going to be getting this accomplished in the timeframe that I had set. Four weeks to tackle 12 years of accumulated stuff seemed daunting. But once we got started, the momentum built and I actually looked forward to finding an hour or two a few days during the week to work on it! I was so excited by the progress that we were making, and for goodness sake, we could actually SEE the FLOOR again! As I continued the decluttering I started uncovering all kinds of things that I had forgotten that we even stored down there. I started to think about other areas in our home where I was storing the same category of “stuff” and it made me want to start tackling those areas too. But I knew that if I headed down that path- pretty soon I would have the shelves in the kids' room all taken down for sorting, and the DVDs in the media cabinet all over the family room floor, and the basement would still be undone as well. So I thought back to a phrase that I learned during my business-woman-career days called “keeping a project in scope“. 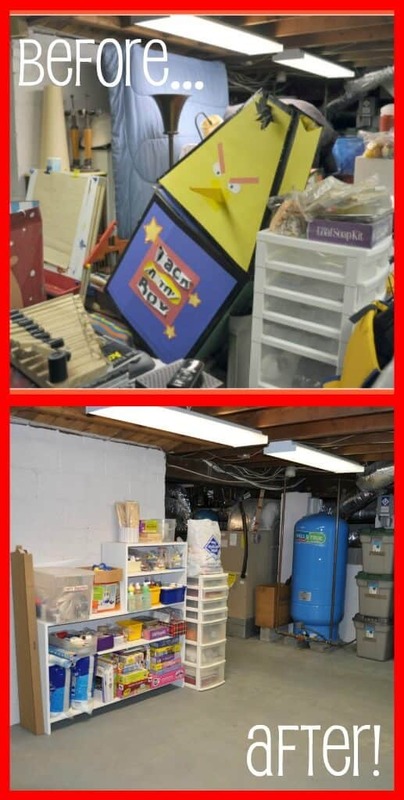 Define the scope of what you are trying to achieve (in this case, a decluttered and organized basement), and then try to limit your work to only what pertains to the original project. So while there were a few times that I did go into other rooms to gather items of the same category (such as the other two places in our house where I had been storing craft supplies), I limited my work in those rooms to only gathering the items! You gotta stay in scope girl! Ahhh- the delight of the purge piles! I wrote a whole post about “what do you do with all of the junk?” because for this project we had ALOT of stuff that we were getting rid of! In some cases, things that I wanted to get rid of likely had some monetary value, and I wanted the chance to sell them on either eBay or Craiglist. However, tackling the sale of that stuff felt “outside the scope” right now- and as I declutter the rest of the house and work to maintain a decluttered home I will continue to find items that I plan to sell. So I created a space in the basement to store these items, as well as the packing materials that I will need to ship them, all in one place until I am ready to tackle that project. I used Good Donor to help me locate charities that accepted donations of the items that I wanted to give away- furniture, lamps, books, kitchen items, and so on. And I was able to schedule a pick up day and time online that worked for me. A good deal of what we were storing was directed to our recycling bins- cardboard, paper, plastic containers, metal, and even e-waste (all of the old computer equipment that we had kept around). And finally some junk is just truly junk that needs to go out with the trash. We bagged up about 7 large black trash bags of stuff. And man- does it feel good now that all of this stuff is out of our basement! Want to see some more pics? Organizing Tools? We Used What We Owned! In our past quests to try to contain all of the stuff that we had stored in the basement, my husband purchased 4 large metal shelving units a few years back- so I was able to pull them into different areas of the basement to create container spaces. I used one to house all of my home decor items, one to hold items that I plan to sell on eBay, one for home items and camping equipment, and one for birthday party presents and supplies and kids school projects. Steve also owned this black grid system that you can use to create storage cubbies. We had been using them to store heaps of shoe boxes and other containers, but once I cleared out most of what had been stored there and moved the grids in front of our oil tanks, I was able to create separate storage sections- one for wrapping paper supplies, one to hold the bins we use on our road trips, and one for all of the containers that I wish to keep around. And about those shoe boxes- I have put them to use everywhere! To contain like items on my craft supply shelves, to hold candles on my home decor shelf, to hold a big bunch of books and CDs related to learning how to play the guitar (not that anyone in our house currently plays- yet!). Shoe boxes are a great way to organize your things- without spending a dime! My advice to someone just getting started with their own basement declutter project? You've just got to jump in and get started. Whether you start small on a 10-minute project, or whether you want to start in the largest messiest area of the house- you need to set your goal and get started. And as you get going- work from left to right- touching each item and deciding should you keep it, donate it, toss it or relocate it? And the criteria to keep an item was that you have to love it, use it, need it, or want it, AND have room to store it! 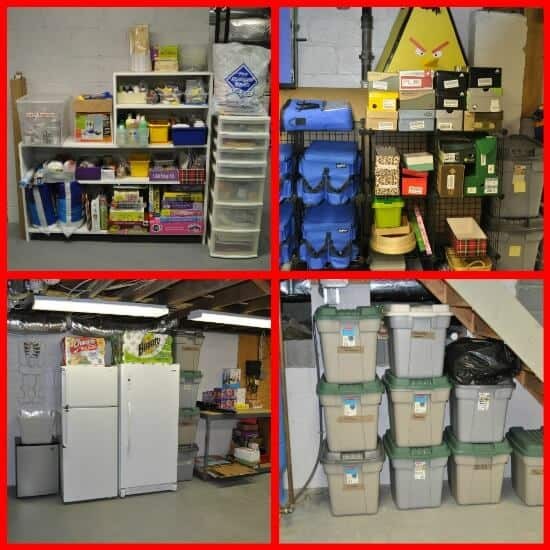 Declutter Your Life- The Big Basement Challenge: Keeping the Project Focused! 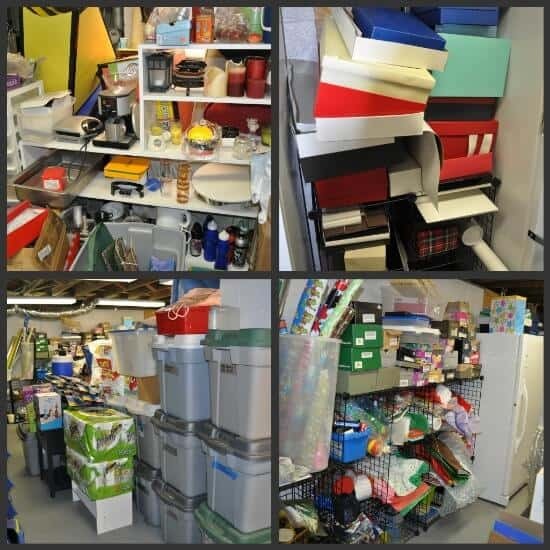 Declutter Your Life- The Big Basement Challenge: What Do You Do With All of the Junk? That is amazing how good it looks. I like the bins you used to stay organized. My wife and I have tried to find time to tackle the project, but it is just so hard to start. I think we might get help on ours. The before and after pictures of your basement are amazing! Our problem space is the garage; whenever we’re decluttering and cleaning out the rest of the house, we just throw stuff in there. We’ve been wanting to be able to bring our car back inside, though, so we’re planning on cleaning out the garage after years of build up. It’s a daunting task, but I’ll be following your advice to only work in 1-2 hour bursts so I can keep the momentum up! That’s awesome Hazel! Best of luck- and enjoy your newly decluttered space! We started our basement de cluttering today. I feel that we just moved stuff around a lot. We did throw out some garbage and donated some stuff. Going to do more tomorrow will keep you posted. Good for you Kelly! I know what you mean that sometimes we spend years doing nothing but straightening the piles and moving things around. 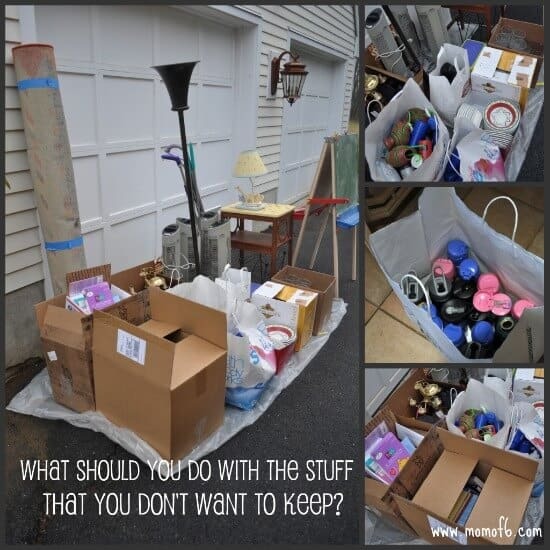 We really only make a dent in the clutter when we pick up and examine every single item, and make an intentional decision of what to do with it! 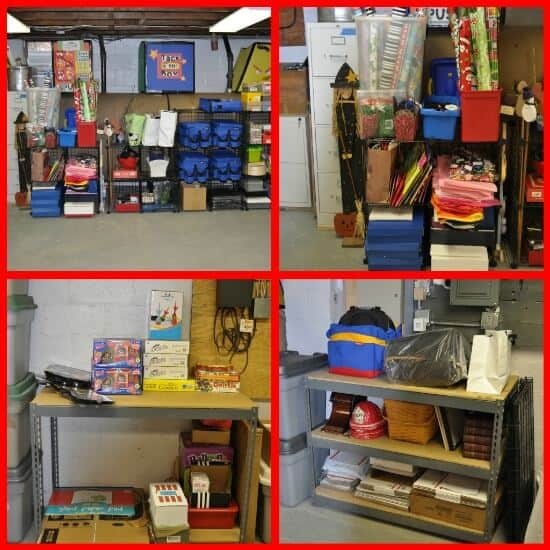 some organization, your basement can become a functional part of your home instead of a catchall for clutter. I’m starting our basement declutter as well! This is helpful to be inspired that it can be done! I found your blog this morning while looking for a legitimate way to put off sorting my house out. It’s not procrastination if it’s research, is it? Anyway, I was so impressed with the difference you made to your basement. 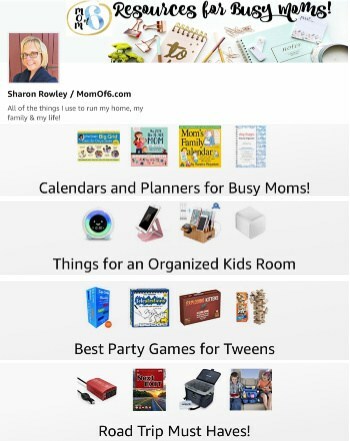 I hope it’s ok that I featured it in my three favourite decluttering projects. Just let me know if not and I will remove the photos and link. in your basement! Your job is not over! Start dumping! 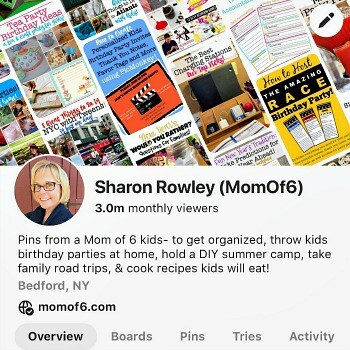 Congratulations Sharon! You did an amazing job, and I think you are dead right about tackling the biggest dumping ground first. I’ve been working at decluttering my home for most of the last year, and it was only after I tackled the craft room/dumping ground that I started to feel like it wasn’t a totally hopeless endeavor. Thanks Mel! I still have a long way to go to declutter my entire house…. I think it is going to take me the rest of 2012 to accomplish it. But at least I just won’t be moving things out of the upstairs rooms and into my basement anymore! Congrats on working through your craft room / dumping ground! Congrats on your first place win!! You did an amazing job! That was a huge project! Thanks Elizabeth! It was a huge project… and hopefully gives me confidence to tackle the next monster…. my garage! YOU WON!! That is SO awesome! Great job!! Thanks Lisa! 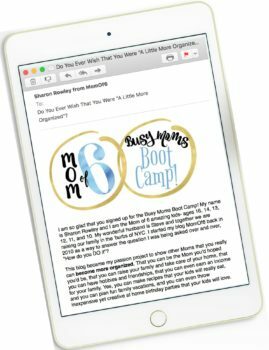 I am so excited to win the challenge- but the “biggest win” was how decluttering this dumping ground has changed everything about how I organize and declutter the rest of my house. As I move on from space to space… nothing is getting stuffed down into the basement! So I guess that I am on the right path! So while you are on working on decluttering your whole house in 40 days (give or take a few due to the flu! ), I think it will still take me the better part of 2012 to eventually get to every closet, drawer, and nook and cranny. But it WILL get done! 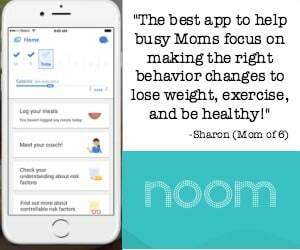 “The problem was that we had developed a habit of cleaning and organizing the rest of the house by stuffing all of the unneeded items from the other rooms into the basement” – Living in a small apartment with a toddler, we developed the same habit with our master bedroom. You did SUCH A GREAT JOB(!) and have really inspired me to get started on our bedroom. Wow Jackie! I am so happy to hear that I have inspired you (and okay, maybe a little relieved that someone else understands how I got myself into such a mess!) Good luck on tackling your bedroom! Great work! I’m really impressed that you didn’t spend any money on things, as that can be a temptation when organizing. I have been working on my house – have recently finished my bedroom and upstairs. It is so wonderful to see the floor. Congratulations again! And what an awesome husband to let you purge as you saw fit! Thanks Erin! And you are right….. my husband Steve has not only been a huge supporter in my decision making… but I’ve been watching him catch the decluttering-bug lately too. I walked into our office this week and saw that he was decluttering a desk drawer…. he gave me a huge grin when he saw that I was watching! You make me want to do a basement. LOL But I don’t have one. Although I do have a garage. LOL Fantastic work girl! Amazing!! Can’t wait to see it. Wow! You did a lot of work! Isn’t it fun to look at the before/after pictures? You make me want to go work on my basement! Wow — excellent work! Must get going on my garage; thanks for the inspiration! Great job, Sharon. I’m on an organizing mission too. Amazing. You accomplished a lot in only 29 days. I may have to break down a do a basement challenge myself. I can’t believe it only took me 29 days (really I was done 4 days early- so only 25!). So WHY did I take SO LONG to get to this? WOW!!!! an amazing transformation! and look at all of that space – amazing! be proud!!! I can’t get over how “big” our basement feels now. Just last month I would have told you that we have a fairly small basement. Well done looks impressive, feels great to walk down there now I bet. Oh my gosh… I love to have an excuse to walk downstairs just to look at it. I still can’t believe that we have so much floor! I think we should start holding family dance parties down there or something! Everything looks great! You did a great job purging so much stuff! Great job! Thanks Stacey! A lot of it was purging… but a good amount of it was also using the basement space better. Instead of piling everything up haphazardly in the middle of the room- we actually created areas where things should go. And finding a better corner nook to store the furniture in made all the difference in the world! great job impressive work. I love how everything turned out. Thanks so much Shirley! I am really surprised and happy with how it all turned out too! I started in the basement for the same reason you did! EVERYTHING gets put down there when you PURGE the rest of the house. 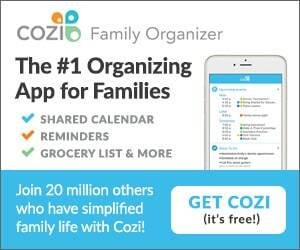 So… do you have a plan to tackle the rest of the house? Join me in my 40 Days ~ 1 Whole House challenge! I considered joining your challenge… I sincerely did. But 40 days to tackle the whole house is just unrealistic for me, and I know that I will be dooming myself to failure. It’s more like 1 year 1 house for me. But I do plan to continue these challenges. I have one lined up already for next month and based on my current success in the basement- I can’t wait to get started! I’ll be watching your challenge! Even as I was typing that comment I was thinking…6 kids… probably not going to happen, but I had to ask! I can’t wait to read how you did THAT!